!! Canada tries to cover up war casualties !! The new Conservative government of Canada, led by Prime Minister and friend-of-Bush Stephen Harper, prevented the media from covering the return home yesterday of four dead Canadian soldiers in flag-covered coffins. The government cites “privacy” as the reason for not allowing the media anywhere near the families of the dead, but at least two of the families of the fallen soldiers are upset by the decision. Harper’s government has also decided to stop lowering the flag every time a Canadian soldier dies in Afghanistan and will lower it only once a year on Nov. 11, Remembrance Day. Next week Harper is expected to issue a press release that Canadian soldiers are in fact not even engaged in a conflict, and that Afghanistan is not a war-torn country, but rather a new chain of roti shops owned by Canadian donut institution Tim Horton’s. 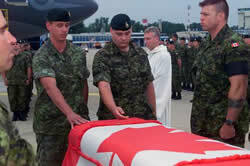 1 Comment on "Canada tries to cover up war casualties"
The new Conservative government of Canada, led by Prime Minister and friend-of-Bush Stephen Harper, prevented the media from covering the return home yesterday of four dead Canadian soldiers in flag-covered coffins.